When it comes to beauty I am your budget kind of gal, as you'll rarely see me splurging on the latest high end release and instead i'll budget and buy from the more affordable brands that are absolutely killing it at the moment. I thought i'd share three of my favourite beauty brands, of who I go to for all the affordable beauty finds and i'd highly recommend checking out! Over the years that i've been into makeup i've always stuck with the old faithful high street brands, and the only products I really splurge on now from time to time is foundation after exploring more of the higher end brands. Having said that, when it comes to 90% of my makeup bag, you'll find all affordable beauty brands, of whom i'll always love and use. NYX have a been a brand us Brits have wanted to try for years, and since it finally made it's way over the pond last year and into most Boots stores, and online at places like ASOS and Debenhams, I myself and many beauty lovers have flocked for their products. Having tried a few of their products, the one area of products that I love NYX for is their lip products, because they are so affordable but also work absolute wonders. A personal favourite of mine is their Lingerie Liquid Lipstick (£7) of which I own a few shades of these, and they are a lovely liquid lipstick that has a long lasting formula and a pretty good shade range also. Another lip product of theirs that I love is their Intense Butter Gloss (£6) of which I never expected to like, but this completely converted my love hate relationship for lip glosses and is probably my most worn lip product from NYX. MeMeMe are a brand i've loved for a few years having been introduced to them through blogging back when I first started, and i've had the pleasure of trying out a few of their products. MeMeMe to me are an affordable beauty brand with a boutique feel, especially as their packaging is a little more special, and gives a higher end feel. A few favourites of mine from them are from across their whole range of products, and not just one area in particular. One product that i've loved for quite some time now is their Dark & Divine Mascara* (£8) as this has a plastic wand applicator that just coats my lashes and gives them an amazing amount of volume in just a few sweeps! Unfortunately mine has been that well loved, that it's now ran out but is one i'd repurchase and highly recommend. 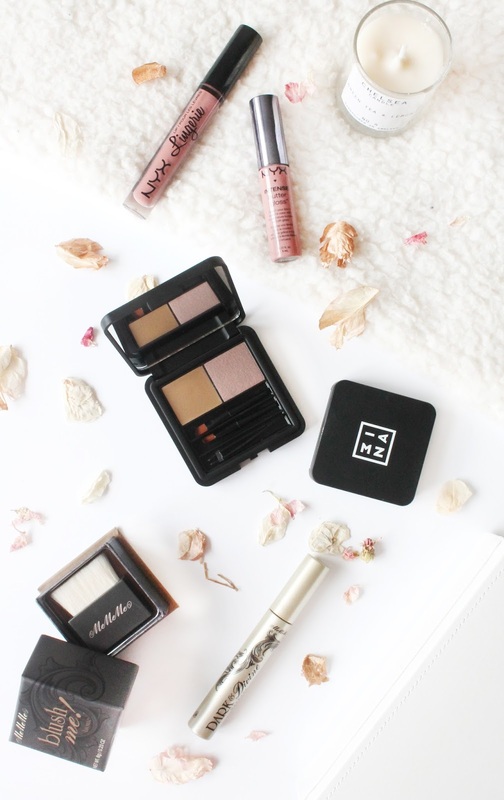 Another product of theirs that I love is their Blush Me Box* (£9.95) in the shade 'Matte Bronze' of which is currently my go to bronzer as it is a more subtle bronze for us pale skin gals, but is easily build-able to give a lovely bronzed glow! 3INA are a newer brand to me, after being introduced properly to them a few months back and so far loving their products, so I couldn't not talk about them. Personally I think 3INA are in a realm of their own, as they cater for people like myself but their products are of a artist level, making them a budget yet high quality brand for professionals also! My favourite products hands down is their The Highlighter 201* (£10.95) as it's the perfect everyday highlighter. It's subtle, yet build-able and I absolutely love using this on a day to day basis! Another product that has recently made it's way into my stash is their The Eyebrow Kit* (£15.95) and i'm an absolute sucker for an eyebrow kit, especially one I can use on the go. What I like about this product is that you have the option to use both powder and/or wax to fill in and shape your brows, and the tweezers make it handy to sort out any unruly hairs quickly! Which affordable beauty brands do you love?